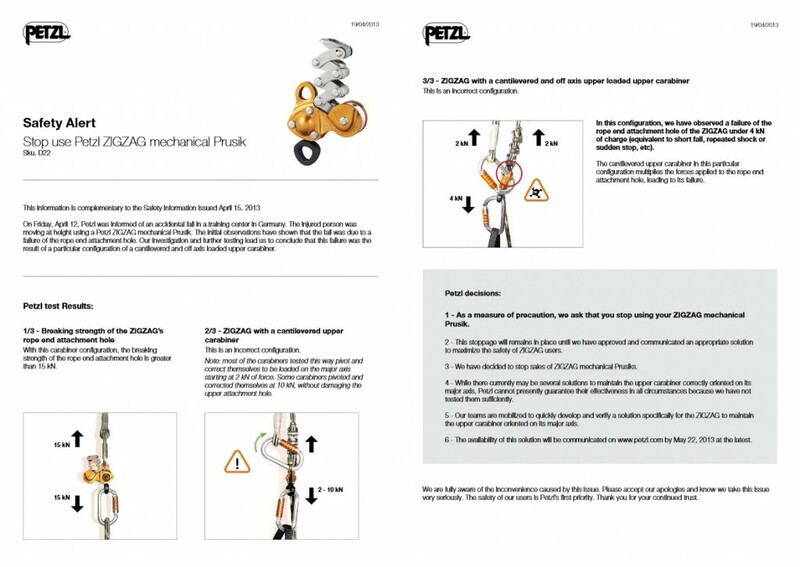 Following a failure of another Petzl Zigzag in the same circumstances as the one which failed in Germany, Petzl have decided to issue a full product recall. This notice overrides all previous notices. Anyone who has purchased a Petzl Zigzag should stop using it immediately and return it to the supplier they bought it from for a full refund. For the full Petzl Recall Statement please click here. Updated version (24 April 2013) please click here. There is your personal safety and health reason! – PPE is designed to keep you safe and inspecting it ensures it is fit for use and will keep you alive! The Work at Height Regulations 2005 require that equipment which is exposed to conditions which may cause deterioration or each time exceptional circumstances have occurred should be inspected. Management of Health and Safety at Work (MHSW) Regulations 1999 require intermittent inspections in between thorough examinations (in addition to standard pre-use checks) should be carried out in accordance with your risk assessment. The Personal Protective Equipment at Work Regulations 1992 (as amended) require employers to maintain fall arrest equipment in good repair, including appropriate replacement. To read more about your requirements and what Abaris International can do to help, please go to our PPE Inspection page. Happy Birthday Abaris International – 10 years old today! Happy Birthday Abaris International – It was exactly 10 years ago today that our MD, former Royal Marines Officer Will Beeley, set up the company. We hope for many more years of success, and that we can continue to exceed our customers expectation from knowledge, service, delivery and after-sales points of view. Thank you to all our great customers for your business, we look forward to being at your service at any point you need us. After years of running marathons and half marathons and wishing to volunteer for anything to keep the middle aged spread at bay, Will, our MD has decided to try a walk! Coerced into joining 3 friends, he will be walking 100km non-stop in about 24 hours in the Yorkshire Dales. The race (he is a former Royal Marines Officer), I mean walk, is all cross country and over the 100km will also ‘enjoy’ doing the equivalent height gained of twice up Snowdon. We have a few “prizes” to entice would be “donators” that we intend to raffle off. Everyone that donates will be put into the raffle. Some of the random “prizes” (and they are very random…) include a brand new Mammut Jacket (£160! ), some Petzl tee shirts, various England Rugby tops, some Umbro hoodies, some sailing gloves, a bottle of Whiskey, a £10 Amazon voucher and a box of chocolates… amongst other things.